The new gush boards launched with me not around to see it happen. A little full of spam to start with, but I’m hoping and praying that’ll faze out and we’ll get some good discussions going. It better. My initial contribution (aside from about two years of pushing to get things done) Making Online Community Work. Which got written on a spot of late night inspiration and some good suggestions from fellow helpfuls. Now… if only it does work? The truth is probably best if anyone asks me if someone’s punched me in the side of my face. They haven’t. I did however have a nasty run in with the side of my car. That is, I was getting in – it was dark and my face met some metal. Minorly embarassing. So I have split lip, a fat lip, a bruised lip, a bit of numb s face and it was one of those pain moments where you feel distinctly like throwing up. Emily was with me and was entirely concerned about me (probably that I’d pass out as I was driving) the whole way home which was a little amusing as I’d said I felt a bit ‘strange’. I still feel a bit sick and the side of my mouth looks a little worse for wear. Laura played nurse and got out a torch and everything when I got home (Mum wasn’t around) and did the whole, “Put ice on it!” thing. Good old frozen peas. I had the extreme rarity of having a day off. Absolutely nothing to do – except email off that rather large assignment before 12pm. This did mean I couldn’t sleep to my hearts content but did mean that I didn’t have to do battle with an oversleep headache which I get far too frequently as I abuse my body clock. Before I emerged from my room, Dad yelled out, “Bye I’m going to Sydney”, “Okay, bye!” I didn’t even think to go out. Shows how used I am to him doing the jetset thing. Not sure how long he’ll be gone. Had the house to myself and so put on some classical music up loud. Had breakfast and sat around the lounge room for a long time, listening to, well I’d guess you’d call them memories. I do not think it’s all that typical for someone my generation to really like classical music unless they happen to be thoroughly musical – which I can assure you I am not. I had a very big thing against most music when I was younger for some stupid reason and the first I ever admited enjoying (loving) was by Handel, Bach and Vivaldi. I dont’ think I could listen to them all the time and I’ve far gotten over my fear of admitting that other stuff is actually rather fantastic. I still would count Handel’s Messiah in my top 10. So I sat and listened and rediscovered pieces like Bach’s Air on the G String (don’t laugh!) which is one of the worlds nicest pieces of music. I spent a lot of time thinking, praying and a good bit of it reading. Have had the Bible out a fair bit more lately which is nice because it means I’m falling back into the habit which I did let slide a little bit, moreso I’m actually enjoying it. I love being home alone and having free range to do things like that alone, outside of my room, which is my hobbit hole and my hermitage. When Laura came home, late afternoon. We sat and watched the rest of Fiddler on the Roof (another something I haven’t seen for ages). There are parts of that movie I can’t stand but the rest of it seems to make up for them. Hodel is by far the best character followed closely by Chava. Perchik: There’s a question… A certain question I want to discuss with you. Perchik: Yes, that is an important element! At any rate, I… I personally am in favour of such a socioeconomic relationship. 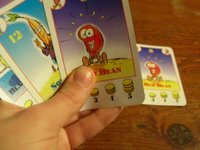 Jess D, Sam and Jacqui came over this evening and we ate chips and played Bohnanza (or the Bean Game) which Jess is in love with for some reason. Jess won and I pulled in a draw for second with the lovely Samantha. They left reasonably early, which was rather nice because ‘tired’ still looms and I had a splitting headache. Now of course I’m up late again with the headache mysteriously gone.